A Hawaiian getaway at Sheraton Princess Kaiulani will be an unforgettable experience! This soothing sanctuary sits on the former estate of Hawaii's beloved Princess Victoria Kaiulani and boasts tropical foliage delightful accommodations, tantalizing cuisine, and a variety of cultural activities. Exploring the enchantment and mesmerizing beauty of the islands on this Hawaiian holiday will be a wonderful gift! With your lovely gift, the trip of a lifetime will be experienced at Sheraton Princess Kaiulani! Here, the true essence of the islands will be discovered with lush natural beauty, pristine beaches, sparkling waters and the welcoming spirit of "Aloha". 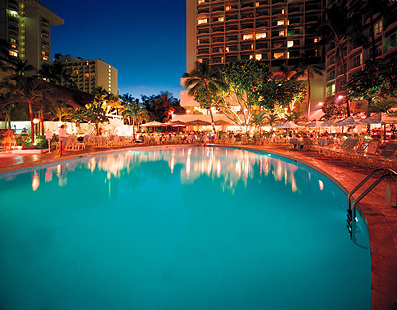 Sheraton Princess Kaiulani boasts enchanting accommodations, sumptuous dining and cultural activities. A stay at Sheraton Princess Kaiulani will be an exceptional island getaway that is just as alluring as it is mesmerizing! Enjoy a decadent treat from the comfort of the suite at Sheraton Princess Kaiulani! A platter of fresh, succulent strawberries covered in rich milk chocolate will be delivered to the room for the ultimate indulgence in tropical paradise! Enjoy a tasty Gourmet Cheese & Cracker Platter at Sheraton Princess Kaiulani! This savory treat will be delivered to the room, and with five different types of cheeses, grapes, strawberries and crackers, it will be the perfect celebratory snack! Take delight in the lush harvest that the islands have to offer! A Deluxe Fruit Basket will be delivered to the room coupled with a box of chocolate covered macadamia nuts, making it the sweetest enhancement to this tropical escape! Indulge in the Lomi Lomi Ola Massage at Moana Lani Spa. In the tranquil settings of the spa, be massaged with long, soothing and rhythmic movements to relax the mind, body and spirit. This healing body treat will induce a peaceful sense of well-being! Moana Lani Spa is located at Sheraton Princess Kaiulani Hotel’s sister property, the Moana Surfrider, A Westin Resort & Spa. Moana Lani Spa offers the ultimate indulgence with the Rollerssage spa treat! In the tranquil settings of the spa, receive this lavish massage that uses heated, semi-precious crystals to achieve a deep relaxation. As these crystals are rolled over the back, experience a peaceful sense of well-being! Moana Lani Spa is located at Sheraton Princess Kaiulani Hotel's sister property, the Moana Surfrider, A Westin Resort & Spa. Take delight in the Heavenly Classic Massage at Moana Lani Spa! In the peaceful surroundings of the spa, a heated compress will soothe the back muscles to relax and ease tension. The grand finale is a massage with the choice of fragrant and organic island massage oils that will leave the mind, body and soul in a pure state of bliss! Moana Lani Spa is located at Sheraton Princess Kaiulani Hotel's sister property, the Moana Surfrider, A Westin Resort & Spa. Receive the Mana'Olana Hope package in paradise! In the peaceful settings of Moana Lani Spa, take delight in the Heavenly Classic Massage and a Heavenly Body Moisture Wrap to awaken the senses and calm the mind! Moana Lani Spa is located at Sheraton Princess Kaiulani Hotel's sister property, the Moana Surfrider, A Westin Resort & Spa. At Moana Lani Spa, be pampered with the Heavenly Moana package! This lavish spa treat will start with a Heavenly Classic Massage, followed by an enticing exotic Hawaii Clay and Vanilla Ritual for the body, face and feet. Thanks to your thoughtful gift, skin will be glowing and radiant while feeling as fresh and fragrant as the islands! Moana Lani Spa is located at Sheraton Princess Kaiulani Hotel's sister property, the Moana Surfrider, A Westin Resort & Spa. This tropical getaway at Sheraton Princess Kaiulani offers the opportunity to take part in the Pearl Harbor Circle Island Combo! Visit the USS Arizona then enjoy a sightseeing tour around the island. On this tour, view the Dole Pineapple Plantation, the North Shore surfing beaches, Windward Coast and make stops all along the rugged southeastern coastline to the slope of Diamond Head! 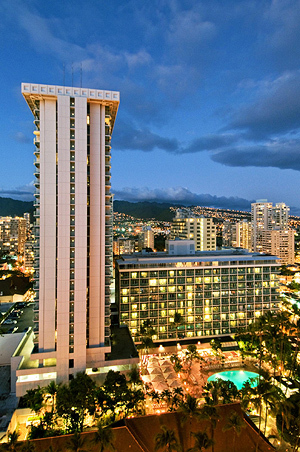 At Sheraton Princess Kaiulani, enjoy the charming surroundings of the Waikiki City View Room! This Hawaiian haven is beautifully designed with a palette of rich creams and warm colors to enhance the tropical hardwood accents and fine furnishings. 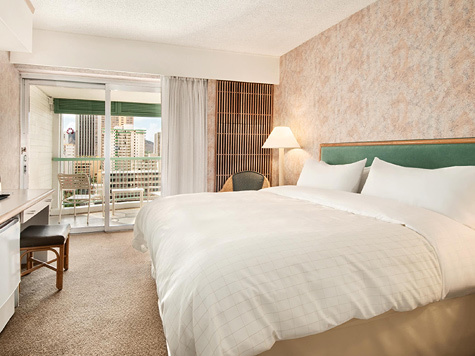 This room boasts a king size 'Sweet-Sleeper' bed with luscious linen bedding, luxurious bathroom amenities and a lanai with amazing views of Waikiki! 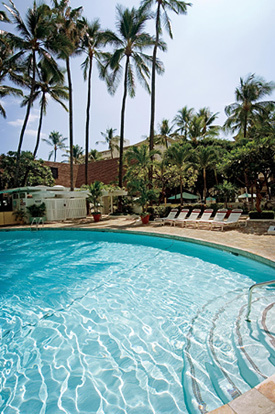 Take delight in the stunning settings of the Pool View Room at Sheraton Princess Kaiulani! Beautifully decorated with a spread of soft creams and earthy colors, dark hardwoods and fine furnishings, this tropical retreat will enhance this Hawaiian vacation by far. 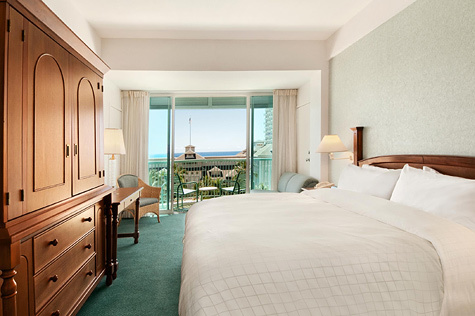 This room promises a king size 'Sweet-Sleeper' bed with luscious linen bedding, lavish amenities in the bathroom and a lanai with stunning views of Waikiki and the sparkling blue pool! 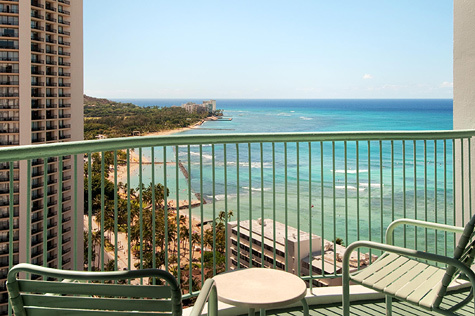 At Sheraton Princess Kaiulani, experience the laid back charms of Hawaii in the Partial Ocean View Room! This soothing sanctuary is designed with tropical decor, fine furnishings, dark hardwood accents and delightful accents of whites, creams and earthy colors. Take comfort in the king size 'Sweet-Sleeper' bed with plush linen bedding, indulge in the luxurious bathroom amenities and admire beautiful partial views of Waikiki and the sparkling blue Pacific Ocean! Indulge in the enchanted surroundings of the High Ocean View Room! This room is beautifully decorated with an exotic design, accents of soft creams and rich earthy colors, tropical hardwoods and fine furnishings. In the High Ocean View Room, take comfort in the king size 'Sweet-Sleeper' bed with luscious linens, enjoy the lavish bathroom amenities and admire the stunning pool and ocean views from the lanai! This Hawaiian vacation offers a memorable experience in the luxurious surroundings of the Deluxe Ocean View Room! This soothing sanctuary is designed with a soft spread of whites, creams and beach tones to enhance the tropical hardwood accents, decor and fine furnishings. The Deluxe Ocean View Room promises a king size 'Sweet-Sleeper' bed with luscious linen bedding, luxurious bathroom amenities and a lanai with spectacular views of the pristine Pacific Ocean! Take delight in the luxurious surroundings of the suite! This stunning suite is beautifully designed with exotic decor, tropical hardwood accents, fine furnishings and a palette of soft creams, fresh whites and earthy colors. This soothing sanctuary boasts a king size 'Sweet-Sleeper' bed with luscious bedding, lavish bathroom amenities and a private lanai with breathtaking views of Waikiki and the alluring Pacific Ocean! 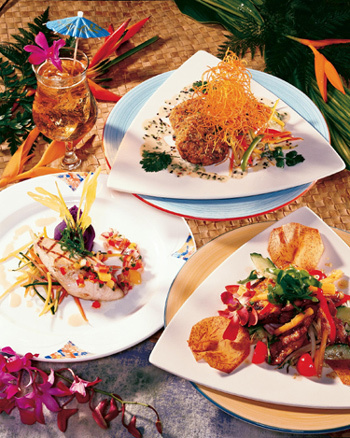 Indulge at Pikake Terrace on this tropical getaway at Sheraton Princess Kaiulani! Boasting poolside outdoor dining, this charming restaurant serves up a delightful breakfast buffet and an enticing dinner buffet featuring American and Asian-Pacific favorites. Discover an exquisite dining experience at Pikake Terrace! Splash Bar & Bento offers the perfect place to sit back, relax and sip on tropical concoctions! While sitting poolside, enjoy the delightful flavors of American and Asian specialties enhanced by their extensive drink menu. In the evening, soothing Hawaiian music will complete the island ambiance of the Splash Bar and Bento at Sheraton Princess Kaiulani! Discover a mesmerizing journey through Polynesia's past! Receive a flower lei greeting, and be seated in the preferred seating area before indulging in filet mignon, lobster and other tantalizing dishes. After dinner, take delight in the beverages and cocktails of choice while watching a magical show, featuring Hawaii's premier entertainers, lavish costumes and vibrant song and dance! Enjoy A Polynesian Journey Cocktail Show at Sheraton Princess Kaiulani! While indulging in tropical concoctions or refreshing beverages of choice, embark on a journey through Polynesia's past. 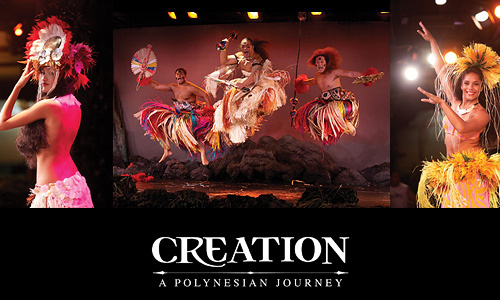 Be amazed by Hawaiian entertainers, brilliant colorful costumes and vibrant song and dance!